Tulia ISD is pleased to announce and welcome Zach Ramos as the new Athletic Director and Head Football Coach. Mr. Ramos has 15 years of teaching and coaching experience with 9 years in Tulia ISD. His teaching experience includes American History, World History, Economics, Government, and currently serves as the Social Studies Department Head. 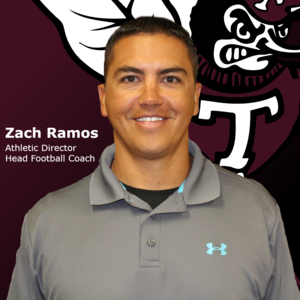 Mr. Ramos’ coaching experience includes Varsity Football where he served as a Special Teams Coordinator and had responsibility for Defensive Secondary Planning at Canyon High School and Seminole High School. Other sports include Head Boys Basketball and Head Boys Track with responsibilities at the Junior High level. Mr. Ramos has a Bachelor of Science in Sports and Exercise Science with supporting concentration in History. His teaching certifications include Secondary History and Composite Social Studies 8-12. We are excited to see Mr. Ramos enhance and continue to build on the great things accomplished by Duane Toliver and the entire coaching staff over the past two years. Please help us welcome Mr. Ramos as the new Athletic Director/Head Football Coach for Tulia ISD.